Is there anything more frustrating than sending out your thoughtfully-crafted resume to apply for one job after another – and never hearing back? Take steps to rescue your resume from the screening trap and get it into the hands of a hiring authority. 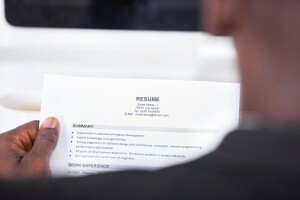 The first checkpoint is to make sure you use solid resume strategy. Tailor your resume to each job you apply for. Don’t assume the employer will take the time to understand how your experience relates to their position. Do that work for them, and use their terminology to describe related experience on your resume. And as in any job search, if you have a contact inside the organization, or were referred to a company contact, note that in your cover letter. In addition to your formal job application, send a resume along to the contact letting them know you have applied for the job. If you need help on the basic resume, visit CareerOneStop’s Resume Guide for detailed instructions. If you’ve covered those bases, it’s time to assess how well your resume fares in the initial screening. In many organizations, especially larger companies, the hiring process starts with an applicant tracking system (ATS). Based on keywords and accomplishment statements, the ATS filters out candidates, and leaves a more manageable number of resumes for staff to review. The ATS first removes resume formatting and scans for specified keywords and phrases. Then, the ATS sorts your resume content into core categories: Education, Contact Information, Skills, and Work Experience. Next, and critically, the ATS compares the employer’s list of keywords, skills, education to your resume content. Finally, those resumes with the strongest match to the employer’s list of desired characteristics, plus your years of experience – go to the human review process. Where to start? The first step is still to demonstrate your claims of skills with specific accomplishments. And, I would add, pepper those claims with thoughtfully-placed keywords. Keywords are the “buzzwords” or “jargon” of the industry. Their impact can probably not be overstated. While you should look for opportunities to use keywords throughout your resume, using a Highlights or Professional Summary section at the beginning instead of a Career Objective, provides a great place to put keywords up front where they will have the most impact. To be sure you use appropriate keywords, check the job posting, review the organization’s website, and check related professional association resources for more ideas. Make sure you really are a match for the position. If your experience is in a different industry than the one you are applying to, build a case for why the employer should see you as a strong candidate, and use the terminology of the new industry where it relates on the resume. For each job you enter, begin with the employer / organization name, then your job title, and dates employed. Reversing the order confuses the ATS. Because IT skills are relevant in so many fields, consider adding an IT Skills section even if you are not in an IT profession. Note any programs you know by name, that are referenced in the job posting. Use a plain text format for a resume that is going to start with a computer-based search. Simple fonts like Verdana or Tahoma are more readable than most others, and a size 11pt or higher is recommended. Text in bold, underline, and italics can be misread by the ATS, so is better avoided, as are graphics or tables. You can always send an additional print-quality resume on high quality paper to the hiring manager or human resources department contact for the position. For the same reason, avoid using graphics or tables. Use bulleted lists instead of writing complete sentences in paragraphs; it’s easier for people and software to read. Be sure to note your postal address in the resume, not in the header or footer, which ATS systems typically ignore.